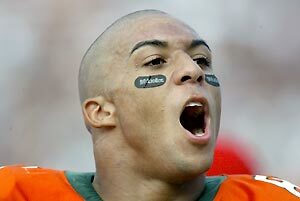 Kellen Winslow Jr. came into the league as a brash football "soldier". Two major injuries and one idiotic motorcycle crash later, Kellen Winslow seems to have toned down his act a little bit. And the truth is, Winslow Jr. has proven to be a tough-minded player who battles through injuries and still posts Top 3 fantasy tight end numbers. We’ll never know how good Kellen Winslow would have been had it not been for the knee injury. Even these past two years, he appears to play with constant pain in his knee. Every single week, he’s on the injury report, usually as "Questionable". Every week, he continues to go out there. Most of the time, Kellen Winslow II ends up producing for his fantasy team. So in that way, KWII has become a fantasy warrior, at the very least. Kellen Winslow II is the son of former San Diego Chargers Hall of Fame tight end, Kellen Winslow. The son is even more athletic than his father was, though he came into the league with an attitude problem. He missed his rookie year with a broken fibula sustained on an onside kick attempt against the Dallas Cowboys in Week 2. Winslow missed the next season due to a knee injury caused by a motorcycle accident, apparently caused after hitting a curb while popping wheelies at dangerous speeds in a local parking lot. After that incident, Cleveland Browns fans (and fantasy owners) were ready to give up on the patently foolish Kellen Winslow. Jason Witten are considered as good of a bet in 2008. It helps that Kellen Winslow Jr. is on one of the best offenses in the NFL. Braylon Edwards will take most of the double teams, while the team added Donte Stallworth to stretch the defense on the other side. Stay away from Kellen Winslow in 2009. Winslow comes with a lot of different question marks: new team, injury history and iffy quarterbacks. Those are some fundamental questions for a tight end in a draft class that has some nice depth at the tight end position. Owners will be tempted to wait a few rounds and pick up a steel by selecting Kellen Winslow Jr., assuming they are getting a guy who is every bit as talented as the top tight ends. That’s true, but Kellen Winslow comes with a lot of baggage. Don’t get me wrong; Kellen Winslow is a warrior. He plays in pain. But the fact is, you shouldn’t have to worry about a starting tight end who’s constantly hurt – which is what Kellen Winslow has been almost constantly through the years. He usually takes the field on Sunday, but Winslow’s health has slowed his ascent to the top of the tight end world. Even if you expect Winslow will be healthier away from the staph infection cesspool that Cleveland seems to be, there are other concerns about Winslow’s new team. One, the quarterback throwing him the ball is going to be a choice between Byron Leftwich and Luke McCown early in the season. While Leftwich is the more talented player (or at least was once in his career), the early buzz is that Luke McCown might get the nod to start the season. I saw Kellen Winslow put a brave face on in an offseason interview and seem excited about reuniting with his former Browns teammate (McCown), I have a hard time believing McNown is the answer in Tampa. The Tampa Bay Buccaneers brass seems to agree. That’s because, late in the season, you might expect to see Kansas State rookie quarterback Josh Freeman could be Winslow’s QB. The Bucs drafted Freeman high in the NFL Draft. If the Bucs season doesn’t go as hoped, the rookie could make an appearance – and nothing hurts fantasy stats more than a rookie QB. You might think a Bucs team which added Kellen Winslow II and Derrick Ward in the offseaso and which signed Antonio Bryant to a big contract after his breakout 2008 season might sound like a team on the rise, but you have to remember that 2008 ended disappointingly enough for Jon Gruden to get fired. New Buccaneers Head Coach Raheem Morris brings a lot of enthusiasm and could spark the Bucs roster, but most of the time, young coaches have growing pains. The departure of veteran defensive stalwarts like Derrick Brooks could really hurt the unit until they find a new leader, while the Bucs could have a leadership void with the departure of other veterans like Warrick Dunn, Jeff Garcia and Joey Galloway. All in all, stay away from Kellen Winslow in 2009, If you want to wait to take a tight end, grab someone like Owen Daniels or Dustin Keller. Or draft a round or two higher and grab a tight end on the upswing, like Greg Olsen. For owners who have never had Kellen Winslow on your roster before, let me offer some advice. If you see Winslow on the injury report, don’t worry about it if he’s considered Questionable or Probable. Questionable is supposed to be a 50% chance of playing, and this is worrisome with many NFL players. But I’ve had Kellen Winslow on one team or another each of the past two seasons. He always seems to be listed as questionable, and he always seems to play. Brian Westbrook of tight ends (except Westbrook has occasionally a late scratch over the years). Unless Winslow is Doubtful, he always seems to play through his injuries. For all his swagger, KWII appears to be a real football tough guy. That’s good, because you want Winslow’s production. And that’s the good thing; seldom do his injury concerns seem to affect his play on the field. Many players will play through an injury, but they are a shell of their healthy self. Kellen Winslow seems to be able to play through it. If you want a tight end high in 2008, I would wait until someone drafts Gates or Witten, then select Kellen Winslow the next time my pick comes around. If he’s not there, move on, but I see Kellen Winslow having as good a shot as anyone to be the #1 tight end this year. His lingering injury concerns make me a little nervous, but he’s 25 years old and shown he can play through them. I doubt Kellen Winslow is a player who will play much beyond 30, but for now, I wouldn’t worry too much about Kellen Winslow II’s injury history. The two major ones were freak accidents.